Arrive in Queenstown, New Zealand’s adventure capital. Collect your rental car from the airport and make your way to your accommodation. In the evening, relive the elegance of turn-of-the-century travel with a cruise aboard the vintage steamship TSS Earnslaw, the only coal fired passenger vessel still operating in the southern hemisphere. 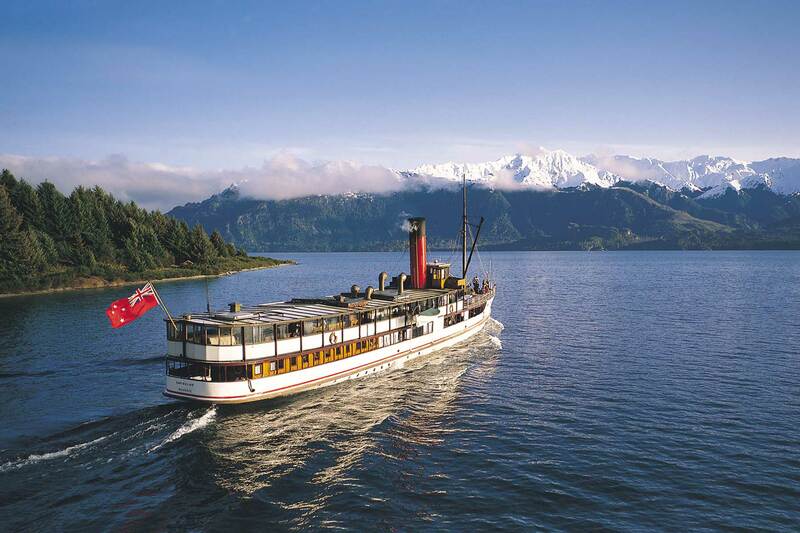 Step aboard – watch the stokers fueling the fireboxes and hear the hiss of the steam engines working as the TSS Earnslaw takes you on a nostalgic cruise over beautiful Lake Wakatipu. Disembark at Walter Peak High Country Farm, where you will enjoy a stunning four course meal. An entertaining after-dinner farm show provides a glimpse into high country farming life. On your return cruise, relax with a drink from the bar or join a fun sing-along with the ship’s pianist. Today, choose from an exciting range of optional activities including rafting, scenic flights, 4WD safaris, winery tours and more. 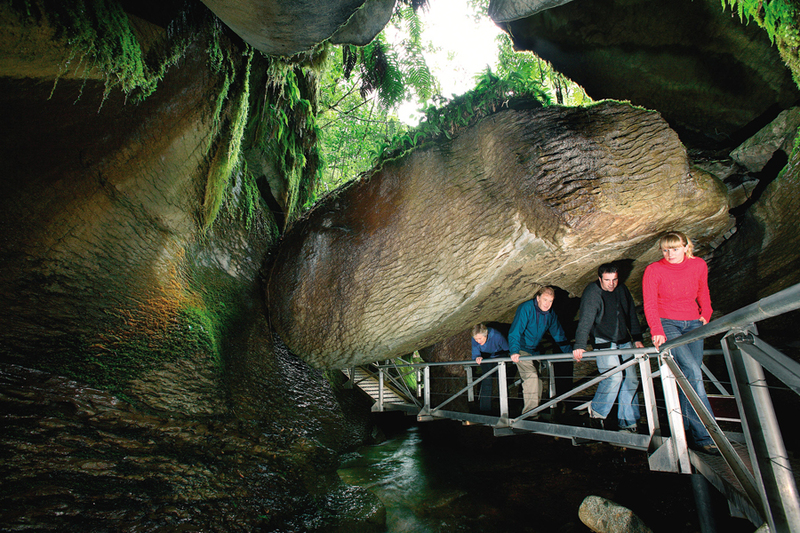 In the afternoon, take the magical Te Anau Glowworm Caves Tour. 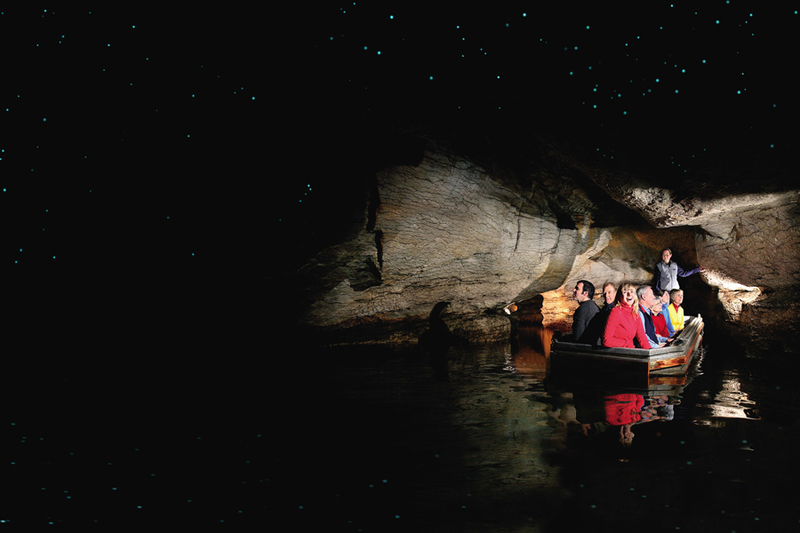 Explore a mysterious underground world of rushing water before drifting in silent darkness beneath the luminous shimmer of thousands of glowworms. Your Te Anau Glowworm Cave adventure begins with a cruise across beautiful Lake Te Anau on board the catamaran Luminosa to the western side of the lake. On arrival, there is time to view the interesting displays at Cavern House before your friendly guides accompany you underground in small groups. As you explore by path and small boat, your senses will be overwhelmed. In this mysterious underground world, discover fossils and rock formations, and view rushing waterfalls and whirlpools. Learn how the caves are still being carved out by the incredible and relentless power of nature before gliding through silent darkness to the glowworm grotto. The delicate incandescence of thousands of tiny glowworms is a magical sight! 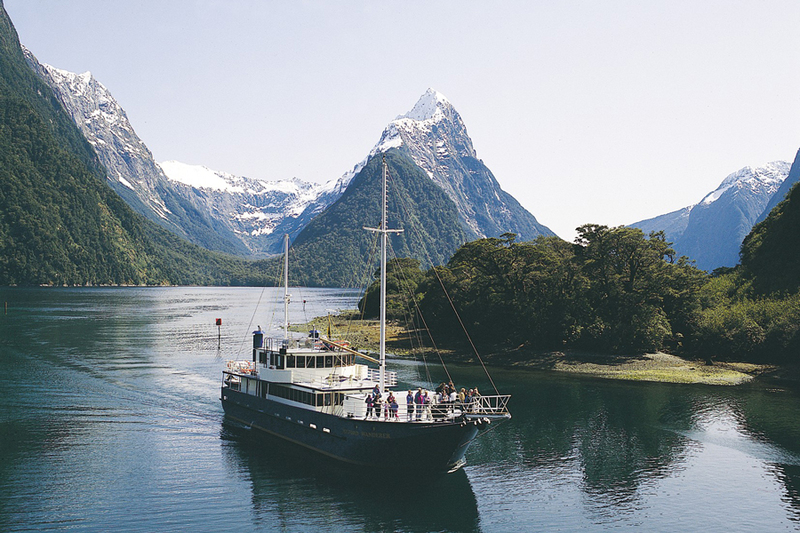 Experience Milford Sound with an unforgettable Milford Sound Nature Cruise! The Milford Road (between Te Anau and Milford) is one of the finest alpine drives in the world. The scenery is exceptional, ranging from broad grassy flats, dense rainforest, and towering mountains through to glacial lakes and alpine herb fields. No other road in Fiordland offers such a diverse glimpse into New Zealand’s alpine zone. 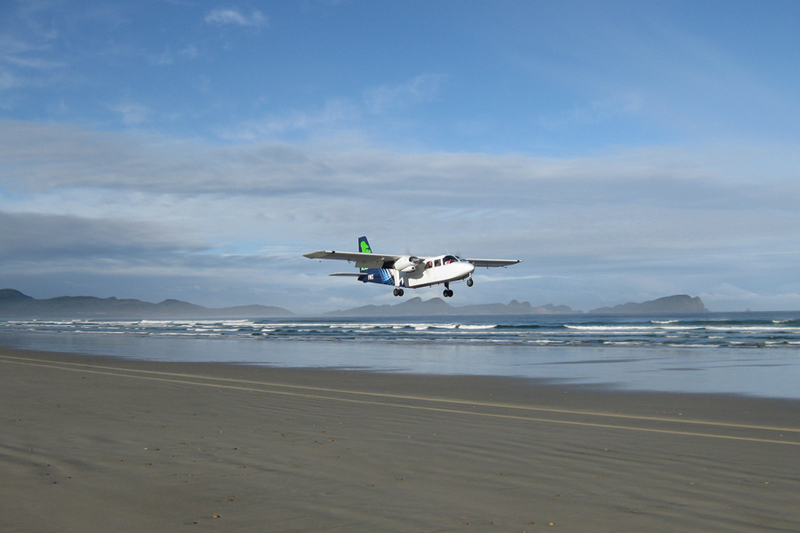 Travel to Invercargill, where you will catch a scenic flight to Stewart Island, New Zealand’s ultimate eco-tourism destination. Its densely forested hills, untouched coastline of rocky outcrops, and creamy golden sand beaches make Stewart Island a haven for native marine and bird life. Stay 2 nights on Stewart Island. 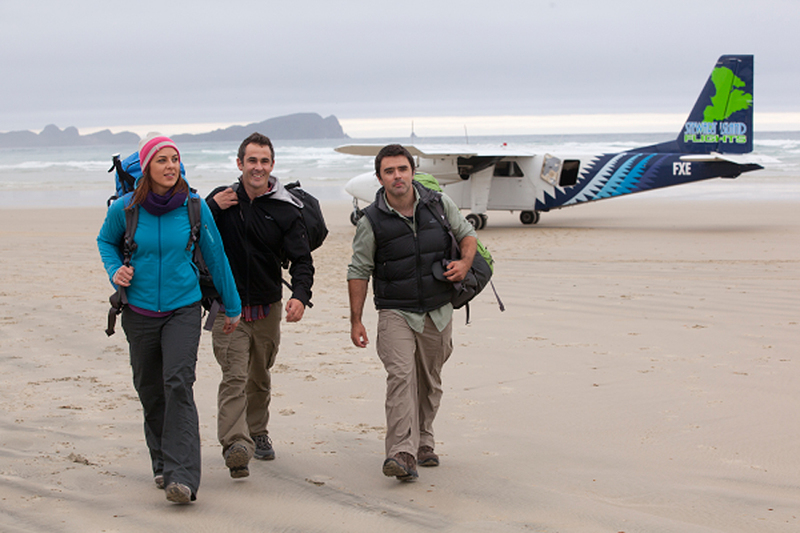 Relax and enjoy Stewart Island for the day. Discover the Catlins Coast, an attraction in itself, whilst travelling to Dunedin, one of the best preserved Victorian and Edwardian cities in the southern hemisphere. Dunedin offers a diverse range of experiences including the Cadbury Chocolate Factory, the Speight’s Brewery, Larnach Castle and of course the stunning Otago Peninsula. 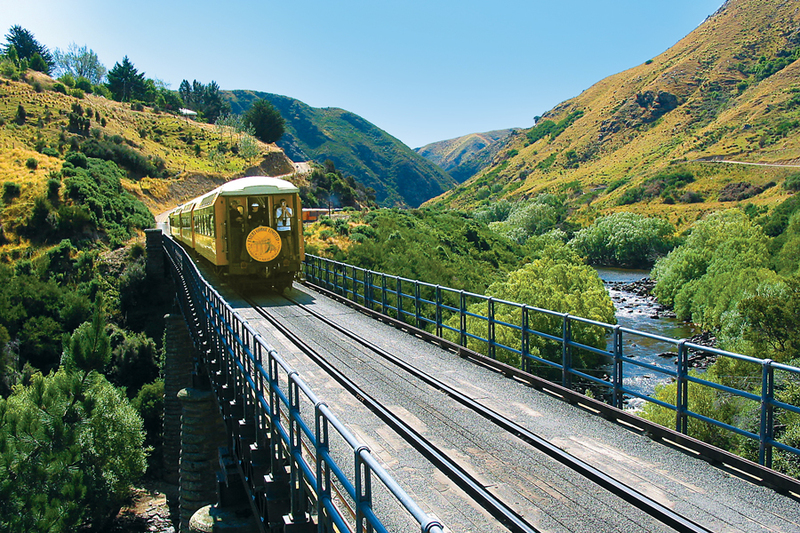 Today, join the Taieri Gorge Railway for one of the world’s great train trips, an experience not to be missed. 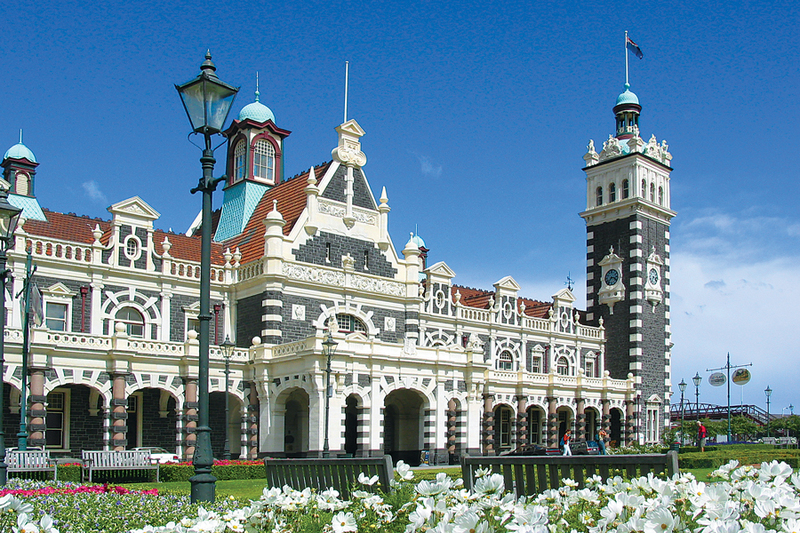 Departing from Dunedin’s beautiful railway station, the Taieri Gorge Railway begins its scenic journey into some of New Zealand’s most rugged, ever-changing scenery. The train travels into the Taieri Gorge, a narrow and deep canyon carved out over aeons by the ancient Taieri River. The train negotiates the gorge with ease as it travels through ten tunnels and over countless bridges and viaducts. The train will stop or slow down at various scenic points along the way, and you will get the chance to take photos or disembark to look around. Stand on the open-air platforms while the train moves, or enjoy a quiet drink and food from the onboard cafe while the train manager tells the story of the nature and history of the area. Drive through historic Central Otago – past farmland, orchards, and vineyards – to reach Wanaka, an alpine town boasting panoramic views and a relaxing atmosphere. Wanaka is a stunning lakeside destination and offers a host of attractions such as Puzzling World, a number of boutique shop, mountain biking and walking tracks and more. Explore Wanaka in the afternoon, then sit back and relax with a glass of local wine or beer at a waterfront restaurant. Drive over the beautiful Crown Range, New Zealand’s highest State Highway and admire the fantastic views along the way. Be sure to stop at the historic Cardrona Hotel for a refreshment before your arrival back into Queenstown. 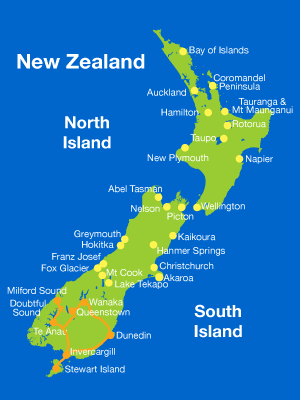 Drop off your rental car at Queenstown Airport and depart Queenstown.